Winter Care. In winter, ideal nighttime temperatures range between 55° and 65°F, but plants can withstand temperatures near freezing for short periods. Give them a spot that receives good light, but keep them out of direct sun to prevent the leaves from burning. While plants do appreciate regular misting and regular watering (some references recommend keeping the leaf rosettes full of water at all times), B. nutans doesn’t need all that attention to thrive. I simply water about every week or 10 days in winter. I don’t worry about filling up the rosettes. For one thing, they’re too small and there are too many of them to make that an easy task. That said, I suspect the flowers would last a bit longer if I misted my plant daily or even every couple of days. I do give my plant a shower occasionally to wash off the dust. Summer Care. 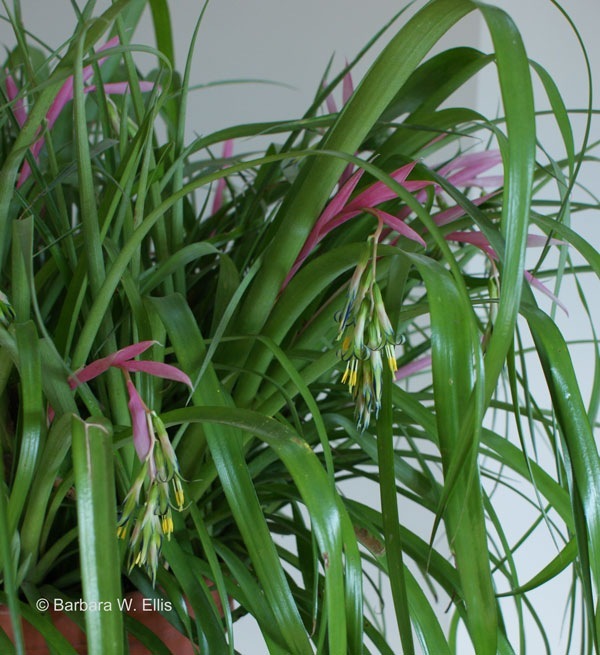 Like my other houseplants, B. nutans spends time outdoors from about May through October. The species thrives in our hot, humid summers, provided plants are kept out of direct sun. A spot in light or dappled shade is ideal. Shade from late morning on is especially important because the sun is hottest in the afternoon. Some summers, I’ve hung the plant in a tree, and other years it has spent the summer on a cement block-and-board installation that houses the majority of my houseplants. I water considerably more often during hot weather—every few days when it doesn’t rain—but that’s something all of my houseplants need. I also fertilize a couple of times during the summer with a dilute fish emulsion fertilizer (only used outdoors because of the smell) or compost tea. Potting Medium. 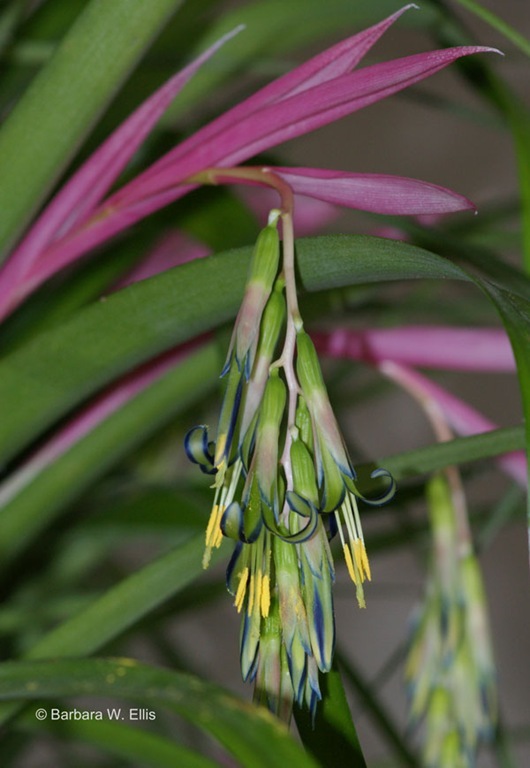 Most Bilbergia species are epiphytes, meaning plants that grow in trees but do not take any nourishment from them. Their epiphytic nature dictates a light potting mix that is high in organic matter and drains well. 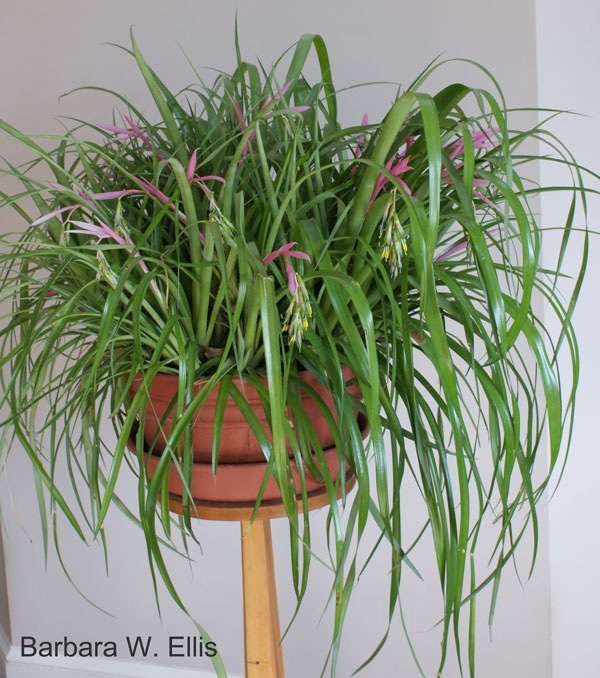 I use a mix that is equivalent to the Bromeliad Society International’s (http://www.bsi.org/) recipe of one part bark mulch, one part perlite, and one part soilless potting mix. My plant is in a plastic pot, so a somewhat heavier mix helps keep it from becoming top heavy. For this reason I substitute crushed stone for the perlite. The easiest source of crushed stone I’ve found is coarse turkey grit. I keep a bag on hand for adding to potting soil mixes and for mulching pots. It is available anywhere poultry supplies are sold. Coarse sand would work here as well. Propagation and Repotting. Another common name for this handsome bromeliad is friendship plant, no doubt because the rosettes are so easy to root and share with friends. (Send me an e-mail if you would like to get a free start of this plant. I’ll need to repot mine in the spring!) To propagate, either divide the clump by chopping it up into pieces as you would a perennial, or separate and plant individual rosettes. Summer is the best time for repotting and rooting offsetts. Keep in mind that individual rosettes only bloom once. After the flowers fade, the rosettes direct their energy into producing new offsetts or suckers. For this reason, browning rosettes will appear in the center of established clumps. When you see them, just pull or cut them out and discard them to make room for new plants.